Do you work for Intuit? Learning about Intuit Payroll? We can help. What I like best about Intuit Payroll is the efficiency of paying our employees. It was simple to figure out initially. We once needed assistance with learning how to add in garnishments for some of our employees and the Intuit support was very helpful in answering our questions. Since then we have had no issues in completing this task when needed. There is honestly nothing I dislike about Intuit Payroll. I have no desire to go with another company. Intuit Payroll takes care of all of our business needs. Use Intuit Payroll for your company's payroll needs! Ease of use, efficiency, and support team are phenomenal. No complaints about this company. With Intuit Payroll we have the ability to pay our employees biweekly in a timely manner. We benefit from using this service because it helps us run our business smoothly and efficiently. "Intuit Payroll — Easy to Use"
With intuit payroll your company can stay organized and keep in communication with its employees on hours, time off, and vacation. It’s easily accessible and can allow you to view your paycheck prior to receiving it. The interface is very user friendly from an employee perspective. At the moment I don’t have any major dislikes. I am still in the first stages as I play around with the system. However while setting up the account you do need prior paycheck information which means a new employee has to wait until their first paycheck to sign up. Get all the information you need and get everyone on board. I think it can be helpful for all employees and employers. It keeps employees informed and helps employees better track accrued vacation and time off. "Payroll done right without the hassle." An inexperience user could easily navigate this software. Intuit Payroll is straightforward and quick to use. This product is efficient to use in a small, medium, or large business. Additionally, I love that we the product has a check printing feature. In addition? It is very affordable. No hidden costs or fees. Moreover, I can create payroll on my computer or my phone using their app. The software has many options that allows a small business to pay taxes, print payroll history, and add/delete employees among a host of others. If a user makes any mistakes, I have found that it is very difficult to correct using this software. For instance, if I owe an employee additional money and it is in another period; I am no allowed to go back in an correct the mistake. Using this product at our small business has reduce the time we used to spend on doing payroll. Payroll can be done quickly and more efficiently using Intuit Payroll. Other software we tried was very complicated to operate and some payroll experience/knowledge was needed. I love how easy the system is for me and my employees to use. Simple is the best way I can put it. Changes within the internal site. There was two different portals employees were needing to log into, and one just stopped working one day, when they switched to the other but it more so looks like you are having log in errors over the site being broken. "Easy To Use Once You Complete Complex Set Up"
It is very easy to manage payroll and create new paychecks, update employees, view reports, give employees access, etc. Whenever I do have issues, they have a VERY responsive help team that is available through chat for 12 hours a day that walks you through everything step by step and helps you out. Payroll in general is confusing and filling out a lot of the required forms would be easier if intuit provided links to the forms they are asking you to upload, or exactly where to find the information they are asking you to input. Even though I dislike that portion of it, the help chat button is very useful and they do their best to help simplify things for you. I would recommend it but definitely get some help from them setting it up the first time. I don't have time to do manual payroll, so having intuit help me by pre populating a lot of the tax forms and submitting them to the government is very helpful They also have a nice to do list reminder on the main screen that will walk you through the different forms that you need to complete and tell you when they are due. You can schedule future payments as well as submit payments right away. "One of the Worst Companies to work with! For everything including Payroll!" Price Point and automatic matching to banking is the only benefit of this product. I've been trying to set up a payroll account for a client and I've spent over 5 HOURS on the phone with QBO and it's still not set up! What type of payroll company takes a month to set up an account and still can't figure out why it won't get set up!??!!!! STAY AWAY FROM QBO ALTOGETHER! THEIR SUPPORT MAKES IT IMPOSSIBLE TO PROBLEM SOLVE! The only benefit to using QBO payroll is the price. NOTHING ELSE WORKS RIGHT! Employee can sing up and view their paycheck before they receive it. when you first sign up employees have to know exactly how much their last paycheck was. Giving social security number is a bit unsettling. Make the switch. Intuit payroll is everything you need for securely logging payroll hours and paying employees by directly depositing their paychecks. I recommend having all your employees sign up on intuit view my paycheck. There they can not only see their check but print their check stubs. Hours can be logged and calculated and employees can be paid in one product instead of using 2 or 3 difference products. Direct Deposit to employee bank accounts. The product sends me email notifications when I need to run payroll or submit tax payments. The opening screen provides reminders and a task list to keep me on track. It is very easy to add or modify employee information - including direct deposits for your employees. You can directly file and make payments to state and federal tax agencies from the site. And it is easy to run reports or access payroll history when needed. Overall I have been very happy with the service. The only thing that might be a "nice to have" would be more reminders on tax payments. You do get 1 notice by email that it is time to file/pay taxes, but it might be nice to get reminders daily until you complete the task. Before using Intuit, I manually tracked payroll and submitted forms/payments through the federal and state web sites or paid my accountant to do it for me. Having Intuit has made payroll so much easier to manage and track. When it is working, with no glitches, it is fairly easy to use. we able to pay our employees, but I don't know that it is helping us solve any problems. I don't recognize any benefits, but I've not used any other payroll software so I don't really have anything to compare it to. I love that you can save your weekly payroll and W-2 for taxes to be taken out right through this app. Just one quick click to pay your employee. It is easy to set-up and use. The interface is very user friendly. Customer service can be improved. I generally know the program better then the one answering my questions. Good program, not so good customer service but worth the time. We needed an online payroll program accessible to several employees. Intuit Full Service Payroll guarantees no errors in paycheques and payroll taxes, I find the tax payment process and e-filing returns to be very straight forward and I have had very few problems ever with errors on returns, The great thing about Intuit Payroll is that it keeps up with a majority of the business finances so everything is kept in one place, It's is also available for tablets, web access and simple interface, its integration with quick books pro, easy to navigate between tabs. While support is available for a generous 12 hours per day during the week, there is no support available on weekends, it's best suited for small businesses managing a very high no of customer's payroll is very difficult, One always needs to update the tax tables or the entire tax calculation may go wrong. I strongly recommend Intuit Payroll as its best suited for small businesses, it eliminates the need for an extra human resource, its cheaper very easy to use and access from any electronic device. As a co-founder of papercrumple.com i find this software very helpful to pay my employees, it eliminates the need for an extra human resource to take care of the payroll job. Payroll allows the flexibility to keep employees happy be allowing for multiple deposit points for varied amounts, or the traditional written check. "Easy to use payroll tool with all the bells and whistles!" I like that this program is simple to use. There are different tabs at the top that allow you to access the information you need quickly and efficiently. The biggest problem with this program is the set up, but I would assume it would be this way with any payroll system the first time around. You do need to have past information which sometimes is tricky to gather with the clients and often time consuming. All our payroll problems are being solved with this program. It is awesome how we can access past years w-2's and reports in case someone wanted that information. 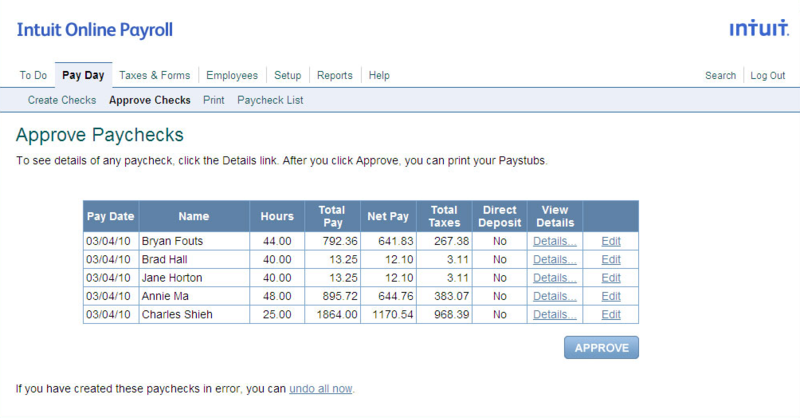 I really like that you can view your paycheck in a clear way and you don't have to go searching for the information. I also really like that it is the same company I do my taxes through (Turbo Tax) and the information transfers with ease. I am also able to look up the information from year to year which makes taxes a bit more bearable. I would like it if there was an app for view my paycheck instead of just a mobile website. It would be nice if there were push notifications on my phone regarding when my paycheck was ready to view and other information that is sent to the site. There is not much that I would change about the software itself as I have never had trouble using it or any questions about where my information is. This is a great streamlines software that will work great for any company. I have had no trouble with this software concerning usability and it's ability to work so nicely with the intuit app and turbotax software is a fantastic bonus. This is a way that everybody can have their information for all the years payroll right in one website. You don't have to go searching for it which reduces the amount of work of a secretary or office manager. The other benefit is regarding the tax information where all the employees are able to see their W2's immediately when available instead of waiting for a letter in the mail. "Worst Customer Service Experience Ever, over, and over, and over again..."
Next to nothing. They file 1099's at the end of the year but that's about it as far as features that you can't get with almost any other payroll program. Customer service is Comcast x 10 bad. I've had to call in 3 times in the last 3 months to attempt to get billing issues corrected and after being on the phone for 2-3 hours each time (mostly on hold), and asking for a supervisor, I've been given answers like "that's weird, we have no idea what the problem is." Apparently nobody at Intuit customer service knows how to service customers for the service I have (online payroll). After calling in 3 months ago to get my bill reduced to the package I'm actually using now, I found out today that I've been getting billed concurrently for the new package as well as the old package at the same time. Still trying to fix it, but according to their customer service hotline they're "currently experiencing longer than usual hold times." This is total BS because these are the exact same ridiculously long hold times I've experienced every time I've called them. Use anything else that makes sense for your company. Only use Intuit if you don't have another equivalent option or if you NEVER anticipate calling customer service. Does payments for our company. The software is simple enough for a person learning to process payroll to use fairly easily, making it easy to train others. It is too simplistic and doesn't allow negative deductions, W-2 adjustments for optional life premiums for coverage over $50,000, no longer supports job costing, no won't properly produce an IIF file to import and no longer sync via Quickbooks sync manager, so I have to manually create a journal entry from the payroll details report each payroll, which can take hours to split all the taxes and benefits into different jobs proportionately to the hours employees worked during the pay period. The software is online, so I can do payroll from anywhere. Intuit Full Service Payroll provides access to HR, managers and A BottomLine Co. to add, edit and process payroll from any location at anytime. They also take on the payroll reporting responsibility eliminating the penalty and fees frequently charged by the IRS and FTB. We're able to pay employees by direct deposit and manual checks whenever it's needed and they have assisted us with garnishments, sick pay and PTO. The only draw back is the buffering time at times when processing payroll or making changes. They really need to add servers or implement some faster processes so things can be completed quickly and efficiently. In the last 20 years we have seem a huge increase in IRS and FTB notices for frivolous issues and Intuit is willing to take on the responsibility of all accurate tax reporting and submissions to the IRS and FTB. They have credited our clients over 5,000 this year alone for errors that we ourselves would have made but now are not responsible for that liability. Thank goodness. What we found is Intuit is in line with other big payroll processing companies such as ADP, Paychex and Heartland but they are much easier to communicate with and have several ways to get a hold of them. But in life you get what you pay for and there monthly fees are about 80.00 per month plus a per employee fee, however when we reviewed all our clients payroll processing fees, this seemed to be in line with what the others were really charging, not quoting. 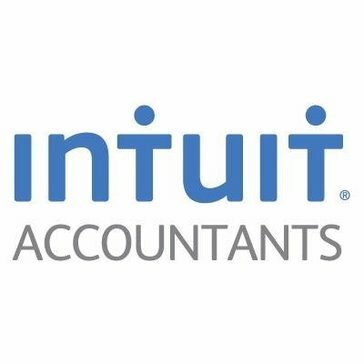 Intuit takes on the payroll reporting responsibility eliminating the penalty and fees frequently charged by the IRS and FTB. I loved how convenient Intuit Payroll was as it was intertwined with out Intuit QuickBooks Enterprise Solutions. It made it convenient for processing. We had many issues with employee direct deposit and were denied access to our payroll account on multiple occasions. It messed up our payroll for a month until we eventually switched to Paychex. I would consider using a different software. It is convenient if you use QuickBooks and Intuit Payroll with your software interface, but when/if you have issues with your payroll, you will be down for weeks. We tried to work through the issues with Intuit Payroll, but they had the worst customer service. When it worked, it was great, but once you got to customer service in another country, they had no clue how to resolve anything. It was a nightmare more then it was beneficial. "Great for my small business"
Automates the vast majority of payroll tasks, and reminds me when taxes, payroll, and forms are due. * If you make a mistake on certain forms you've already submitted, you may have to correct them directly with the relevant federal or state agency, i.e, Social Security Administration. I haven't looked at other services, as my needs are simple. If you have lots of employees, need to integrate with other software, or have complex payroll challenges, do your research. I can't imagine the headache it would be to run payroll on paper. Yikes. This software handles almost everything for me. "Intuit Payroll is an excellent service for small businesses"
A simple payroll wizard walks you through the entire setup. Every employee is easily set up including pay schedule, their pay types and the deductions are automated.. This is a very professional setup and you get more bang for your buck vs going with another vendor or payroll company. The difference among the premium version is a great choice for employees count of over 50 or more. Our company grew and used this service and insisted that it should be available for small business version. With some many hats to operate as a small business, this software version was quite high on the learning curve and dedicate many follow up questions before getting solid on performance. Just making the version availlble for the premium in the beginning trial so that the end user can provide feedback for the company to invest in the upgraded tools and helpful guides make it better and worth the time. After getting our dedicated HR person going, it was easy for the new employee to quickly adapt this version. They were happy with the migration from using a similar service with past employment history. Once you get the whip cracking on how powerful this works, the best easier is to understand the importance of payroll solutions. "Intuitive product for bookkeepers and accountants"
I like that it does what it says and breaks out the taxes properly. It's a bit tricky to figure out what costs go where when you're using it for multiple clients, but all in all easy to use and a good product. It is very do it yourself but has support available if you need it. All in all a great product if you're considering adding payroll to your company profile. If you have a really large staff to pay this could get complicated quickly however I find it works really well for smaller companies with 1 - 15 employees. We needed to run payroll for smaller clients and this product fit the bill as the most cost effective solution. I t was a really great add-on to our normal accounting work done in Quickbooks. I really appreciate the intuitiveness of the whole program and how easy it is to use. "Use of payroll for company employees"
Though it may be a security feature, i dislike that most every time i try to sign in using the same machine, an email or text needs to be sent to the primary user for verification. i dislike that we cannot have multiple admins without notifications being sent to the primary every time something is done. we are easily able to automate payrol. "I use Intuit Payroll for small business clients." I like the fact that Intuit puts their money with their mouth is and guarantees error-free paychecks. I like that it tracks Paid Time off and accrues other employee benefits. I also like the capability to run this payroll software from my Ipad. It does not offer a check signing or check stuffing feature, and I have to manage the distribution of the checks myself. Definitely use this software, it will be cheaper than going with ADP and you can personalize this to your business whenever you like. This software has solved my payroll tax problem, 1099, and W-2 problem. Before purchasing this software I spent a lot of time filing payroll taxes, and processing tons of W-2s and 1099s. This software takes care of this for me. This is the simplest, yet most comprehensive payroll software we've ever used. It easily integrates in with the rest of our QB processes. Nothing, actually. It's perfect and does everything we need. It covers all aspects of payroll with payments, and reports, we never have to worry. It's familiar to me, easy to use and I don't have any problems Also easy to explain to new employees. Nothing' I have no problems using intuit Payroll. The few times I have had a problem, Intuit was able to resolve it immediately. Easy to process and integrates perfectly with Quickbooks. Produces reports I need for my clients. "Easy to use for basic payroll"
I love being able to export paychecks and payroll tax transactions directly to QBO with a click. And submitting payroll taxes and returns is so simple! I wish there were more customizable options for deductions. I have some situations that IOP4A won't handle. Streamlining and automation. No more having to manually enter payroll transactions in the client's QBO file. Helps organization and I can quickly access information. It automatically calculates certain taxes to make it easier to create payroll checks. Not enough helpful resources available when I get stuck. I only used for small business, I’m not sure that I can recommend it for a bigger business so more research would need to be done in order to decide if the software is right for you. It’s taken a lot of the headache out of doing payroll. I use both Payroll and Quickbooks so it’s nice to have one company to use for all back office tasks. I like being able to access my paychecks online easily and being able to see the breakdown of all charges. I'd like more preferences or be able to update my direct deposit information if it changes. Mailed checks are becoming obsolete. It's much easier to have all your paychecks available to be viewed in one place. "A User Friendly Solution for Small Business Payroll"
I've found Intuit Payroll to be one of the easier payroll systems to navigate. After working for payroll companies with different software and using the QuickBooks Desktop payroll, I find the tax payment process and e-filing returns to be very straight forward and I have had very few problems ever with errors on returns. When there is an overpayment for a tax or an incorrect amount is calculated due to a change in the setup of an employee there are times when I need to call Intuit so that they can make the tax adjustments. This takes more time, but I can see how it prevents error when people don't know what they are doing. Also, I've had trouble once an account is closed and the business wants to review their old records in the online version, but we've had trouble getting access to back records due to login issues. I highly recommend Intuit Online Payroll for a small business solutions for employee payroll. I am helping to solve small business owners need to pay their employees accurately and without a lot of hassel. I find one huge benefit to Intuit Online Payroll is that once you sign up with the initial government paperwork for tax filing, you don't have to bother the owner any more with more signatures or go to a bunch of government websites with different logins to pay all the taxes. You only need to set a business up once to make tax payments with the click of a button. "Intuit Payroll for a small to mid sized company is a great alternative to a payroll service." There are two main items that make Intuit Payroll ideal for small to mid size corporations or even individual at home business's. The first is the ease of use. I have been in foreign countries and processed my payroll. It has been after working hours and of course I can process my payroll. Whether you have hourly paid employees or salaried employees, whether you pay commissions to outside representatives or simply have people want printed paychecks and some who want direct deposit into 3 different accounts, Intuit payroll can do and do it well for a fraction of the price of a payroll processing company. Second, is the peace of mind in knowing that not only is your payroll and the applicable taxes done correctly, but that they are placed in the proper place for your bookkeeping and the associates ease in make the monthly and quarterly payments to the appropriate taxes entities. Dislikes are minimal, as the process moves step by step through the process. That said, an easier to read report that would pop up to print with monthly and year to date figure as well has now the payroll affected your cash flow during that pay period, would be a nice option. If you currently struggle keeping up with your payroll and associated tax liabilities and payments, then give it a try. It’s simple, fiscally reasonable, and you can feel confident that your payroll needs are being met. The perpetual problem to business is keeping costs down while keeping employees content. Intuit Payroll allows the flexibility to keep employees happy be allowing for multiple deposit points for varied amounts, or the traditional written check. All this while be economically responsible for the company. "Intuit is the ultimate payroll service"
I’m can see how much my upcoming check will be! I donKt dislike anything except for the fact that it shows each check desperately and not together when you need stubs. It allows me to get my payroll with convenience. That the software is easy to learn especially if you don’t have any experience. That I must submit payroll within 3 working days. Payroll is usually the same amount every pay period. If I notice the net pay is higher I will go back and double check hours submitted for each employee. When needed I can easily generate payroll reports for hours worked for the department per employee. I also like that if an employee needs a copy of their check stub or W-2 form I can access it with a simple click. Need Payroll help? Intuit is the one for you! There’s nothing I don’t like. There’s a learning adjustment at first but you get used to it pretty fast. Payroll issues when dealing with a small business are best solved with Intuit. I use Intuit Online Payroll for Accountants, and it allows me to customize the level of services we provide for each client. It's easy to use, and the mobile app rocks! I would love the option of emailing the IIF import file directly from the mobile app, much the way it will automatically email employees that have online access for their direct deposit paystubs. If you're a small business owner and don't have experience with Payroll, use findaproadvisor.com to do the setup for you. I solve the need for a payroll service for my clients; it eliminates the stress and headache for them of setup, paying liabilities and filing returns. "Clunky, not automated. caused many fees." We liked the idea of running payroll ourselves, but wished that we never used it. That fact nothing is automated, no one to support you, really run the risk of getting into trouble with the IRS and the State if you do not know what you are doing. No support to help you. Terribly expensive. Try using www.gusto.com instead for payroll. Much better support and cheaper and very feature rich. Paperless. None. We would never use this again for payroll. "Quick, Simply, Easy to Process Payroll"
Quick, easy to use, straight forward payroll tool that allows you to easily add and remove new employees. Offers direct deposits, simplifies payroll taxes and send them on my behalf. Limited number of pay rates per staff member, which in a mid size staffing firm like hours can be limiting as many employees might work at 8 or 10 facilities and have pay rates for each. Helps to make payroll efficient in a company that might have a different number of payees weekly depending upon which temp/part time employees worked in a given week. Offers direct deposit so we don't spent time cutting checks. 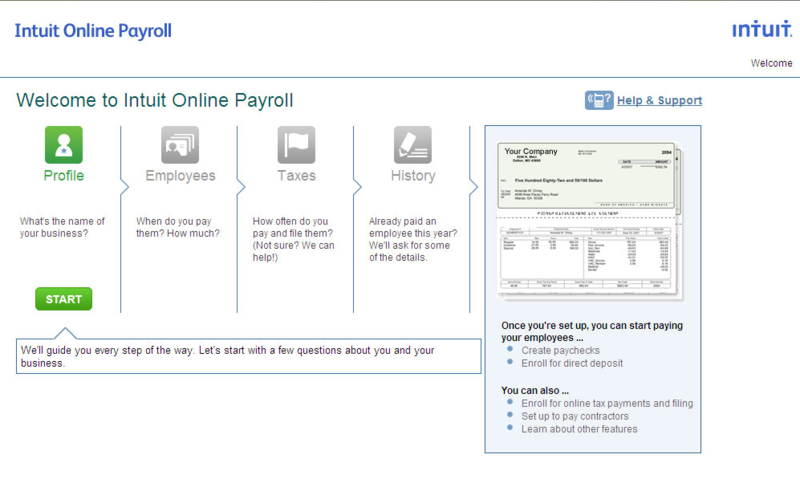 "Intuit Payroll is easy and simple"
It was very simple to set up, easy to access, and very easy to run payroll. The reminders are also very helpful. We wish we had more control as when to pay certain things. Intuit has a variety of applications that have made my life easier when it comes to my business and rental properties. Really take the time to use it thoroughly for your business and you will see its true benefits. I use the software for rental property incomes, expenses, tax information and organization. Easy to use, compatible with Quickbooks. In all honesty, there is nothing that I dislike about Intuit Payroll. Staff enjoy the self serve features and it is saving us money. The consistency of service across their various payroll product offerings. The wait time for a customer service rep during peak payroll processing seasons can be lengthy. I am highly satisfied with the quality and consistency of the Intuit payroll products. The integration with one-click integration with QuickBooks is very easy to setup and a favorite feature of mine and my clients. I strongly recommend you consider one of the Intuit products for payroll. You won;t be disappointed. The reporting functions available help to eliminate time spent on payroll tax calculations and verifications. The ease of excel exporting allows me to quickly obtain and narrow down the information I need. The setup is more complicated than it should be. Those who are unfamiliar with payroll taxes and rules may be intimidated by the options or unsure of how to enter payroll liabilities and benefits. Look at all of your options and consult with your tax advisor. Have the payroll reviewed quarterly to be sure that all of the program's calculations are on point. As an accountant, I do occasionally find calculation errors. The reporting functions of Intuit Payroll are one of the tools I use most often as an accountant.